Facebook and Twitter have taught us that people of all ages love to utilize the web for self-expression, connecting and staying in touch. 3D virtual worlds have similar characteristics: the ability for self-expression via customized avatars and the creation of your own ‘island’; the ability to connect with friends (or meet people you’d never get a chance to meet in the real world); and the ability to be part of a vibrant community. In addition, 3D virtual worlds offer a fully immersive environment, that allows you to escape from the real world – and, experience virtual representations of real-world locations. For virtual worlds experiencing declining usage, however, “community” becomes a challenge to maintain (i.e. imagine using Facebook when none of your friends or family are using it). Mark Kingdon (in-world: “M Linden“), the CEO of Linden Lab, laid out his vision of Second Life’s evolution, tying it in with the recent acquisition of Avatars United. Kingdon’s blog posting generated a wealth of comments from the Second Life community – I’d characterize the comments as mixed to fairly positive. My own reaction to the blog posting was very positive – my use of Second Life (and other virtual worlds) would increase based on my knowledge of in-world events/happenings attended by members of my social graph. Here are my thoughts on how to increase community engagement and social sharing in a 3D virtual world. With Avatars United, according to Kingdon, “you’ll start to build an activity feed (similar to Facebook or Twitter) that keeps you in closer touch with the people you’re connected to in Second Life.” While I see value in a single feed that aggregates content from multiple social networks, I see equal (if not more) value in direct integration of Twitter, Facebook, etc., into the virtual world. The Twitter API and Facebook Connect make doing so fairly straightforward. A B2B company with an island in Second Life may want to integrate a Twitter stream that displays tweets related to the company. Similarly, the company could prompt visitors to tweet about their visit and have that message be distributed to all of the visitor’s followers on Twitter. By enabling this, the owner of the island generates “free” promotion to the social web – and, the underlying platform gains wider reach as well. A relevant analogy is Ustream’s Social Stream, which allows viewers to “chat with your friends over Twitter” while they’re viewing a live video. On the Facebook front, imagine if the virtual world platform enabled Facebook Connect, thus allowing residents to sign in to Facebook and find a list of their Facebook friends who are also residents. Then, imagine showing users a real-time list of their Facebook friends who are in-world right now, with “links” to teleport to the friends’ locations. Borrowing from another popular service (Foursquare or Gowalla), the virtual world platform could enable residents to “check in” at different locations (islands). Broadcasting their whereabouts to their social graph may result in more “planned encounters” within the virtual world. If my friends just checked in to “virtual island”, I may choose to teleport and join them there if I happen to be free. Virtual worlds could create a stronger “shared experience” by allowing visitors to leave a trail of breadcrumbs reflecting their visited locations. If I “friend” someone in-world – or, if an in-world resident is a Facebook friend of mine, then I might want to follow the path they took during their last session. Additionally, the platform could support location endorsements, in the same way Facebook allows me to “like” a friend’s wall posting. As I enter a location in the virtual world, I can see whether members of my social graph previously visited – and, what their comments were. Alternatively, I could see a list of all past visitors – with a link to view their in-world avatar and profile. If a past visitor panned a location, but I enjoyed it, allow me to send an offline message to that user, who can read my message the next time she logs in. This allows me to connect with other users even when they’re not online (a form of virtual world email). 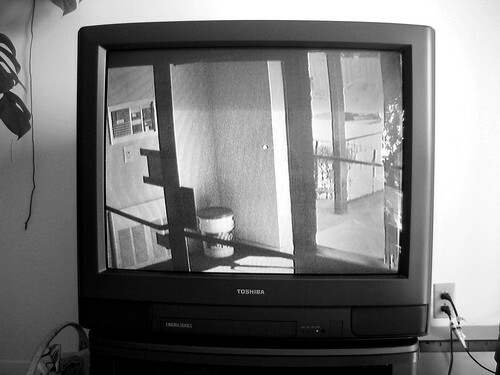 Business owners leverage closed-circuit TV technology to perform surveillance of their store front or office. Wouldn’t a similar service be useful for virtual world residents, especially those who “own” an island? While we tend to be online during our waking hours, it may not be practical to be in-world all the time. How about a virtual world thin client – it provides a read-only “view” of a given location, similar to closed-circuit TV. Since it doesn’t allow you to navigate, teleport, interact with others, etc. – the client is entirely lightweight and can sit in a corner of your desktop with only a portion of the CPU/RAM consumed by the full-blown client. So if you’re interested in a given location, the closed-circuit TV can alert you to visitors – and with one click, the thin client can launch the full client and teleport you to the location. Services (like this one) that can instantaneously connect users are a win-win – they generate more logins to the platform and enable more connections, upon which a stronger sense of community develops. Alternatively, the virtual world platform can provide even more lightweight notification mechanisms: it can generate an email, Twitter direct message or Facebook email whenever a user enters a designated space. The notification could contain a link that teleports the recipient into that space to connect with the current visitor(s). As Twitter and Facebook have demonstrated, users of social services are inclined to share interesting content, often in the form of web links. Within a virtual world, “sharing” often results in the launching of a web browser to render the shared page. Why not provide sharing capabilities that render the shared content on an in-world wall or projection screen? This keeps users engaged, while retaining their attention in-world. Building upon this, I may want to look up Facebook friends and be taken to all locations in which they shared content in-world (as I have an interest in what my friends are reading and sharing). Facebook has a great utility that allows me to record a video on my laptop’s webcam, upload it to Facebook and share it on Facebook. Virtual world platforms should enable users to press a “record” button and have their current session saved for later playback. Perhaps I’m attending an in-world concert or watching a keynote presentation – capturing a recording of the session allows me to share it with members of my social graph who weren’t able to attend. Treet TV provides similar services (with professional quality) – this capability empowers end users to create on-demand programming with the click of a mouse. 3D virtual worlds have a lot to offer already – by adopting useful social sharing services, they can tap into the phenomenon (social media) that’s the force behind many of today’s most popular web sites. This entry was posted on Monday, February 8th, 2010 at 8:47 PM and is filed under Virtual Worlds. You can follow any responses to this entry through the RSS 2.0 feed. You can leave a response, or trackback from your own site. It could be a great way to discover new content and increase the social bonds. Simon – yeah, good thought there – activity feeds (of your ‘friends’) are a feature that the platforms ought to consider as well. real entertainment certainly is being created. I also think it would be great to have a feature which allowed recording inworld. PookyMedia does some great Machinima (Which is the technical ter for “Cinema done on mahine.”)and I also see Virtual Worlds as being a great platform not only for media but to also build branded communities upon. Thanks, Pooky – I’ll have to catch an upcoming broadcast of “The 1st Question” on treet.tv. oh my god how terrible depressing.. more attempts at making the wonderful virtual into the boring mainstream.